Juan and I are well aware that this talk of 100+ seats – out of 165 – for the opposition puts us very far from the conventional wisdom. With well-regarded pundits seeing 55 seats as the MUD’s best-case scenario, our numbers look crazy. To see how we get them, you need to grasp the way the CNE-designed voting system could inflate the opposition’s margin…if we have an exceptionally good day at the polls. What this shows is that Venezuela’s complex electoral system, which is constitutionally mandated to ensure minorities are represented proportionally, does no such thing. Instead, it has a marked tendency to produce Supermajorities. And while the entire system is gerrymandered to benefit the government – after all, a 50%-50% electorate would give PSUV 61% of the seats – it’s also true that if the opposition can clear a relatively manageable bar – 54% – then it starts to get a greater proportion of seats than it had popular votes. Indeed, on 56% of the vote, the opposition is looking at 63% of the seats! That’s where those seemingly crazy 100-seats-for-MUD forecasts are coming from: from estimating we get 55-56% of the vote. Yes, the system is rigged. 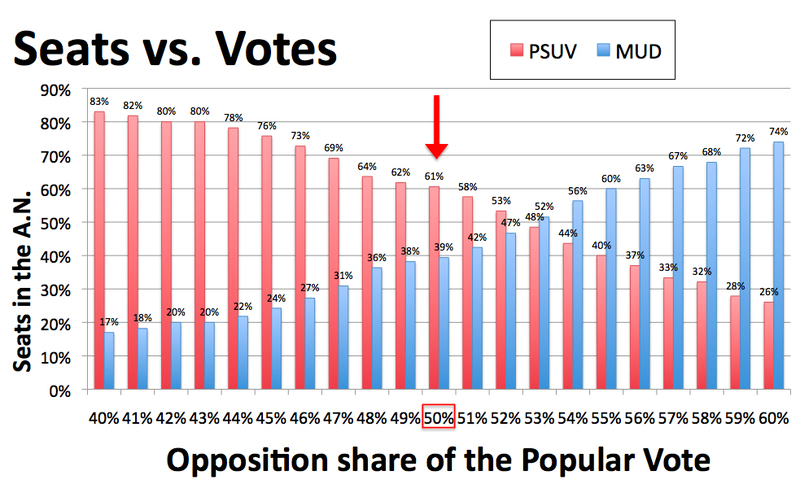 On 56% of the vote, PSUV would get 78% of the seats – 129 in all. No, that’s not fair. But the point is that the government’s popularity is in the doldrums, so it’s imaginable that we’re going to end up towards the right hand side of this chart. Hey, crazier things have happened.